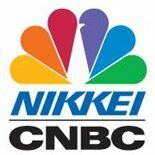 News TV Channel / Nikkei CNBC is a business and financial news television channel broadcast in Japan. It is owned primarily by CNBC Asia and Japanese media group Nihon Keizai Shimbun and TV Tokyo Holdings Corporation. The channel is a result of the merger of the former Nikkei Satellite News (launched 1990) and Asia Business News (launched 1997, renamed CNBC Business News in 1998) by an agreement with CNBC Asia and Nihon Keizai Shimbun.